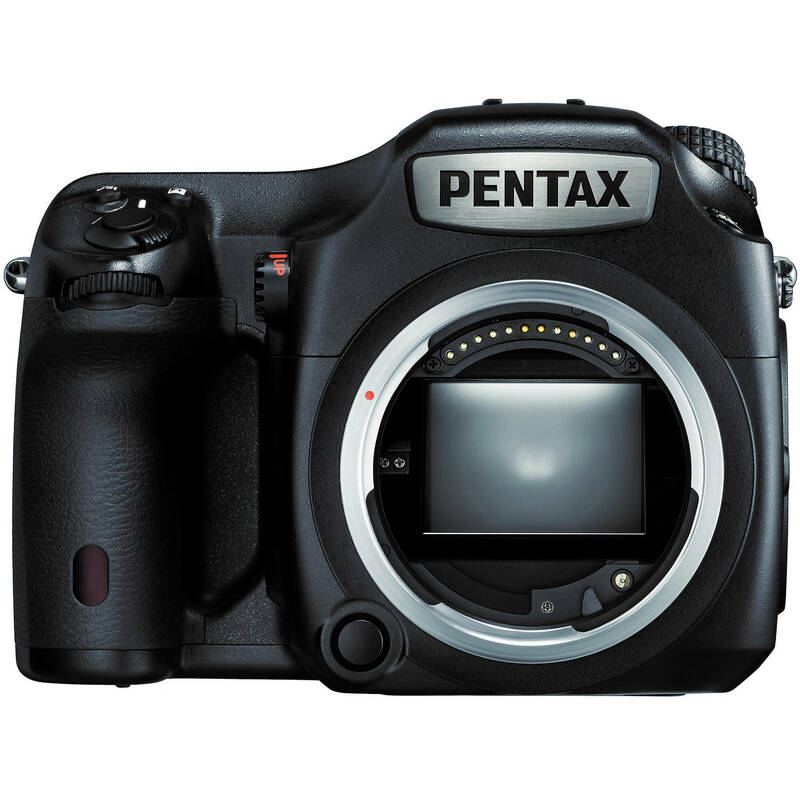 The 645Z Medium Format DSLR Camera (Body Only) from Pentax features a 43.8 x 32.8 mm CMOS sensor with 51.4 effective megapixels. The sensor is designed without an anti-aliasing filter to maximize sharpness and details. RAW files can be recorded at 14-bit and saved using either the proprietary PEF format or Adobe's DNG format. An ISO range from 100-204,800 and high S/N ratio provides low noise, low light capability, and the Prime III image processor lends itself to fast image capture with a maximum of 3 fps continuous shooting. The SAFOX II autofocus module utilizes 27 autofocus points including 25 cross-type sensors and 3 AF sensors dedicated for low light focusing. The new Real Time Scene Analysis System features an 86,000 pixel RGB light-metering sensor for enhanced accuracy of exposure, white balance, and auto-focusing. Full HD 1080 60i/30p/24p video capture is supported in the H.264 format with a dedicated button for instant switchover from stills to video. An external microphone jack enables high quality audio recording with manual sound level control and monitoring. An HDMI port outputs HD images to HDTVs and a USB 3.0 jack enables fast image transfer to your computer. Interval recording for time-lapse videos is supported with an output of UHD 4K resolution. A 3.2", 1037k-dot, tilting, air-gapless, LCD monitor enables live view composition and playback viewing from a various angles and a trapezoid-shaped glass prism viewfinder with Kepler telescope-type eyepiece unit provides traditional eye-level composition. The design of the viewfinder also helps to achieve the relatively compact size of this medium format camera. The 645Z is extremely durable with an aluminum alloy chassis, magnesium alloy shell, and 76 specific weather seals to keep out moisture and dust. It is a camera designed for field as well as studio and can operate in temperatures from 14-104°F. The camera body also features a deep set ergonomic grip, ideal for hand-held shooting, easy-to-access buttons, and a top-plate, sub-LCD screen that is angled up for easier visibility of camera information. A hot shoe mount is supported, and in addition to the tripod socket on the camera's base, a second tripod socket is located on the side of the camera for convenient and stable tripod shooting in the vertical position. Two SD slots are provided for versatile image storage and both Flucards and Eye-Fi cards are compatible for wireless image transfer. A free plug-in is available for seamless tethered shooting support in conjunction with Adobe Photoshop Lightroom, along with the USB 3.0 output for fast performance. The 645Z is compatible with the new FA autofocus lenses as well as older 645 lenses and with Pentax 67 medium format lenses when used with an adapter. The 645Z offers a 43.8 x 32.8 mm 51.4MP CMOS sensor, which is ideal for ultra-high resolution imaging, large printing applications, and cropping flexibility. Compared to a CCD sensor, a CMOS sensor provides higher ISO sensitivity, expanded uses for live view, faster continuous shooting, and improved movie recording capabilities. The optical, low-pass, anti-aliasing filter found in most CMOS sensors has been removed from the 645Z design to maximize image sharpness and fine details. RAW files can be recorded at 14-bit and saved using either the proprietary PEF format or Adobe's DNG format for greater post-production control and flexibility. The 645Z offers a fast frame rate of 3.0 fps, quick image processing to rapidly review images, and swift image transfer with USB 3.0 computer connection. A sensitivity range from ISO 100 to 204800 along with enhanced noise reduction capabilities enables effective low-light capture. The 645Z supports full HD movie capture in the H.264 format at 60i, 30p and 24p, including the ability to switch from still image to video recording with the flip of a dedicated switch. Equipped with a built-in stereo microphone and a terminal for external microphone connection, the user can also adjust the audio recording level manually and visually monitor sound levels during recording. In-camera time lapse sequences can also be recorded using the built-in intervalometer, allowing up to 2000 shots to be recorded with 2 second to 24 hour delays, and output as 4K (3840 x 2160) files. A 3.2", 1,037k-dot, air-gapless, LCD monitor is available and features a tilting design (-35° down and +125° upward) to benefit use from high or low viewing positions. An electronic level gauge can be utilized with either the viewfinder or LCD monitor during shooting, and when working in live view, a variety of grid overlays and manual focus peaking can be used for greater focusing accuracy. A large, trapezoidal-shaped, glass pentaprism with Kepler telescope-type eyepiece enables bright and clear eye-level finding with 98% frame coverage. The SAFOX II autofocus module maximizes 27 AF sensors and a vast light sensitivity range of -3EV to +18EV. The new focus module includes 25 cross sensors and three AF sensors dedicated to low light focusing. The new Real Time Scene Analysis System features an 86,000 pixel RGB light-metering sensor and improved algorithms that further enhance accuracy of exposure, white balance, and auto-focusing. A Multi-Pattern Auto WB system can be used to intelligently adjust white balance settings when mixed lighting is prevalent. For example, if both flash and ambient lighting are utilized, different white balance settings are used within the different regions of an image to more accurately portray overall color balance. Offering a compact build for a medium format camera, the 645Z provides an ergonomic grip, large buttons, and 76 specific weather-seals to protect the camera from moisture, sand, and dust. It is capable of shooting in temperatures ranging from 14-104°F, and its aluminum alloy chassis and magnesium alloy body are durable for years of service in studio or on location. Dual slot SD/SDHC/SDXC memory card support ensures fast and reliable storage for high resolution image files, simultaneously saving in multiple formats, assigning images to different cards based on their original format, or easily holding one memory card in reserve. In addition to standard SD cards, the 645Z is compatible with Eye-Fi and Flucards for wireless image transfer and with the Pentax Flucard remote camera control from a compatible smart devise. The 645Z is compatible with new D FA autofocus lenses as well as older 645 lenses as well as Pentax 67 lenses via an optional adapter. Customizable RAW/Fx button for direct access to a common shooting settings. USB 3.0 output for high speed data transmission. Mirror dampening hardware minimizes the effect of camera shake and noise levels during the image capture process. A second tripod socket on the camera's side enables convenient and stable vertical tripod-mounted shooting. The sub LCD on the camera's top plate is angled for better visibility of camera setting information. HDR (High Dynamic Range) shooting mode with RAW-format data filing. A free Pentax Tethered Capture Plug-In is available for tethered in shooting conjunction with Adobe Photoshop Lightroom and its associated mobile apps. The camera must be updated to firmware version 1.21 or later in order to support tethered shooting with this plug-in. Manual mode(s): Manual (up to 3 settings can be saved), Color Temperature (up to 3 settings can be saved), Copying the white balance settings of a captured image possible. Shutter Speeds Auto: 1/4000 to 30 sec. Box Dimensions (LxWxH) 10.0 x 9.291 x 8.583"
645Z Medium Format DSLR Camera (Body Only) is rated 4.8 out of 5 by 36. Rated 5 out of 5 by lehman from Smart Buy For The $Average$ Guy This is a very well built camera body. I am using it with a 150mm prime tele lens. It does not feel nose-heavy at all. Well balanced, comfortable hands fit. I say hands because you will need both of yours to hold it steady. It is heavy. I'm Ok with it because my other camera is an Rz67 (the Fridge). The 645z is easy to set up. Waist level viewfinder is great for low angle shooting without having to get down in the dirt. I am quite impressed with the solidness of this camera body. If the internals last as long then I should be good for the next 10 years. That's a lifetime in the digital world. Don't risk a digital back for a 45 year old H. Buy this unit plus a lens for half the money, get the same output. Rated 5 out of 5 by ajb from Great Camera I purchased this camera to use along side my DSLR for times when I can slow down and shoot with the purpose I want. I'm mainly using this camera on a tripod but with good technique I think you can find great results hand holding this camera as well. That being said even tiny movement and that 51MP won't hold the resolution and you could have been using something more forgiving. The low light properties of this camera are amazing and far and away top my previous Canon. I've shot at 51k ISO and made wonderful prints, truly amazing. Rated 5 out of 5 by Ron B. from My new best friend I rented a 645Z before purchasing, when I returned the rental I felt like I was leaving part of me there. I came home and told my wife that I just had to buy this camera. I'm 71 and have owned many 35mm and medium format cameras but this is my new favorite. I read one review that stated this camera wouldn't make you a better photographer. I strongly disagree. I think this camera encourages my love of photography to the point of having to take more photos, which will improve anyone's ability. I have not used (nor intend to) the movie function of the camera so cannot comment on that feature. In closing I would encourage anyone serious about their profession to try this camera, it's hard to get more bang for the buck than the new 645Z. Rated 5 out of 5 by Anonymous from Just an incredible piece of equipment. I can't add much to what's already been posted about this camera. When I got my first real keeper image and pulled it in for post processing, it was pretty dark and -being a Canon owner, I was worried I had wasted a great sunset because I didn't bracket. So I pushed the exposure 2 stops, then the mid-tones 3 stops, pulled back the highlights a little and there it was. It reminded me of when museum curator's restore painting and remove the years of dirt that builds up; those perfect colors were always there just below the surface. Silky smooth, tack sharp and no noise or blown highlights. One shot. I'm a believer in this camera's capabilities -as are just about all who have also commented. I'd buy it again in a second. Rated 5 out of 5 by Maciej J. from A nice medium format camera I have been wanting a medium format digital camera for some time and, after considerable research and agonizing over my real needs,I decided to take the plunge. As always with BH the camerat came promply and properly packaged. I had also orderd the f/2.8 75mm lens. I mounted the lens and did some test shots. The portraits were impressive with great resolution and, at f/2.8 a very nice shallow depth of field. Landscapes were also impressive, with great resolution and feeling of depth. The controls are pretty intuitive after having used a number of digital SLRs including the 5DII. I have only had the camera a short time so I have not had time to totaly explore its capibilities, but I am impressed with what I have seen so far and look forward to exploring its capibilities further. Rated 5 out of 5 by Bev from Wonderful camera. I have used this camera for landscape and horse portraits (with many horses you have to stand at a distance when photographing them). I've wanted to get a digital medium format camera for a long time. Mostly because I want Hi Res photos that can be printed at a large size. My Canon EOS1D Mk4 does a great job on my horse photography but after cropping the images become too small to print at 30x40, for instance. I have not had a chance to print anything that I've taken with the 645Z yet but hope to soon. The digital files look fantastic, even after cropping. The physical size and weight of the camera are a bit more than I expected. I have to use a tripod when photographing with the 400mm Pentax lens to get perfectly focused photos. Well worth it though. It was very easy to learn how to get around on the 645Z. All dials and knobs very intuitive. Rated 5 out of 5 by Shane from If your serious about photography... This is nothing short of AMAZING! Jaw dropping, emotional even. The files you can produce are beyond anything you can imagine...my primary rig before getting my Pentax 645z was the Nikon D-800 so resolution was no stranger to me, but the tactile and true to life photos you can achieve are without equal. I honesty cannot say enough about this revolutionary camera. Your clients will not ever be able to look at another photo the same, trust me! They'll never go to anyone else again. Rated 5 out of 5 by Jerome X. from No buyer's remorse I am a portrait photographer that occasionaly does commercial work. I print large prints. A lot of large prints. I took a leap of faith when I pre-ordered the camera as I had never used a Pentax. I could not be happier. The files are amazing. The camera is snappy and really easy to use. I came from a Phase One body... I don't regret the switch, The body is solid and lenses are stellar (90 mm 2.8 and 55 2.8 presently). what is the crop factor? in other words, what is the 50mm lens equivalent in 35mm full frame (what is the normal lens)? For all Pentax 645AF2, 645AF and 645A lens you mount to this camera youll multiply the given focal length by 0.79 to calculate the 35mm-equivalent focal length. As such, a 50mm lens on the Pentax 645Z Medium Format DSLR Camera would be the equivalent of a 39.5mm lens on a 35mm film camera. Can you use the HDMI output to see the live view image when shooting still photos with the 645Z? You would be better off using the usb 3.0 port and tethering. In order to mount Pentax 67 series leaf shutter lenses onto the 645Z, you will need an adapter such as the FotodioX Pro Lens Mount Adapter for Pentax 67 Lens to Pentax 645 Mount Camera B&amp;H # FOPP645AP67. Please see the image below for reference. If I want to use this camera to shoot video and record on a separate outboard recorder, can a get a clean feed off the sensor via the HDMI cable ? No, unfortunately the Pentax 645Z does not have a clean HDMI output. Yes there are. Best bet looks to be the Hartblei super rotator (45mm f/3.5 for architectural) which is available with a Pentax 645 mount. Search for Hartblei on ebay, and make sure you are looking at medium format lenses. Is Pentax software necessary to download photos to a computer? Absolutely not. It's just like any other digital camera. Copy the files on the memory card to your hard drive by inserting the SDXC card into a card reader or a built-in card slot, using the Mac Finder or Windows Explorer. Then you just need to use one or more raw conversion applications which support the files. There's no need to use Pentax's own raw conversion app, based on Silkypix, for that. I never connect my cameras to the computer with a cable directly and download files that way, so the situation could be different in that case. I would like to know what is the largest photographic print anyone has produced using the 645z? I have printed 22 x33 and the quality is superb! At 240 ppi, the native size of the image would be 25.8 x 34.4 . Does anyone make lens adapters for this camera, for example, to use Contax 645 lenses? EntThere are lens adaptors for the Pentax 645Z, but the customer would need to be specific about what other lens (Canon, Nikon, Zeiss, Sony, etc) theyre trying to attach onto the Pentax because different brand lens bases have different mounts.er an answer to this question.